NEW PRICE in DAYANEE SPRINGS!! 407- 3156 Dayanee Springs Boulevard has a NEW LOWER PRICE!! FABULOUS CONDO IN DESIRABLE DAYANEE SPRINGS, WALK TO TOWN CENTRE & TRANSIT! This one Bedroom, one Bathroom home offers bright, open plan living with contemporary finishes. 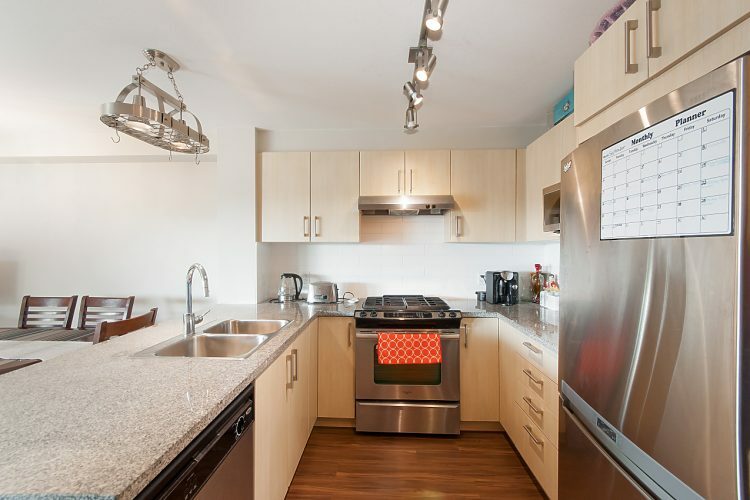 The Kitchen features granite countertops and stainless steel appliances, including a gas cooker and plenty of storage. Enjoy warm laminate flooring throughout and views of the green space from the Living and Dining Rooms. Sliding doors lead to your large, sunny balcony for a barbeque and glass of wine! Enjoy membership to the Timber Clubhouse, a private residents-only Clubhouse offering resort-style recreation including an outdoor pool, whirlpool, sauna, terrace deck, fully-equipped gym and games room. Centrally located at the base of Westwood Plateau, Tamarack is within easy access of all levels of schools, transit and amenities. Walk to Evergreen SkyTrain station, LaFarge Lake, the Coquitlam Centre Mall, Pinetree Secondary and Douglas College. This home comes with one underground parking space and plenty of visitor parking. Pets and rentals welcome – this is a great investment opportunity that won’t last! Call for private showings Sat 10-11am and Wed 6-7pm!